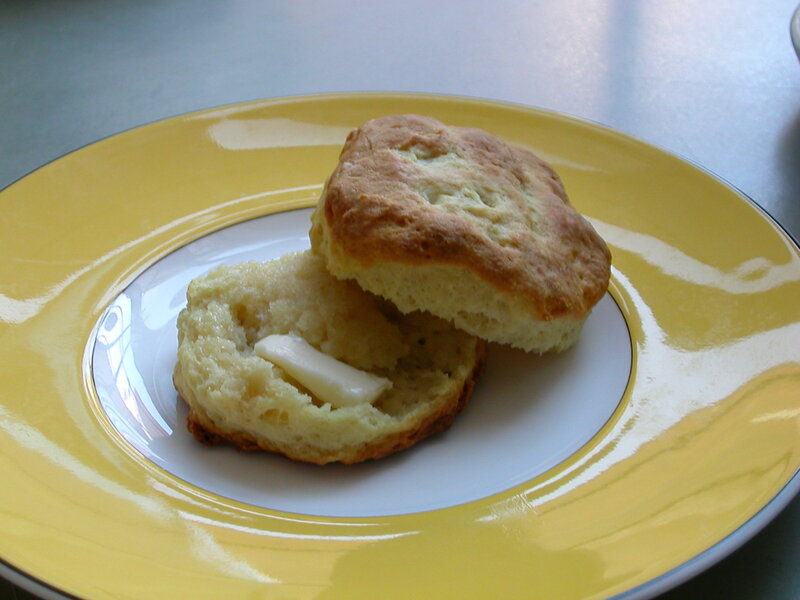 Daddy makes terrific buttermilk biscuits and my friend Michael – my cake baking advisor from last week’s post – has revived my envy of the skill. Year after year, weekend after weekend at a little piece of paradise in Upstate New York, Michael makes biscuits that leave me in awe. Although he has encouraged me many times, I don’t dare touch the dough lest my hockey-puck curse take hold in his kitchen. So Michael mixes and rolls and bakes and I watch and gobble up a little more than my share of the biscuit bounty. And proceeded to try and teach me. A WORD ABOUT THIS RECIPE: IT’S GOOD, BUT IMPERFECT. I have a call in to Michael for some extra tips and thought I’d peruse some other recipes this week to try a variation or two this weekend. So there’s more biscuit intel to come. 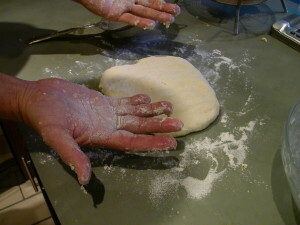 Flour the counter or a cutting board and turn the dough out onto this surface. 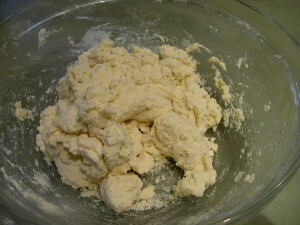 Turn the dough over just once, until it’s covered lightly with flour. Now this is the part everyone emphasizes: DON’T OVERWORK THE DARN DOUGH!!! If you do, you’ll get HOCKEY PUCKS! Then trifold it, folding 1/3 of the disk into the center, then the other 1/3 over that. Turn it over, press out into a disk about 6 inches again and repeat the 1/3 fold-over five times and STOP! Press the dough out until it’s about ¾ inch thick and use the rim of a glass or an empty can with the lid cut off to cut out the biscuit rounds. It helps to dip the rim of the glass in water, periodically wiping the rim of clumping dough. So here’s the thing. I never actually TOUCHED this dough. This was a lesson, and an overall success. I’m curious to hear and read what others think about using Crisco rather than butter. There was also something just a little tiny bit dry about these to me, maybe just a tad too much baking soda. Thoughts? So this week I’m reading up, gathering advice from my Daddy, my pal Mikey and my friend Dolores. Then it’s time to take what I learn and get my hands dirty again, or doughy, as the case may be. 2. PREP BUTTER: Cut it into cubes as your first step and put it in a bowl in the freezer until right before you need it. 3. 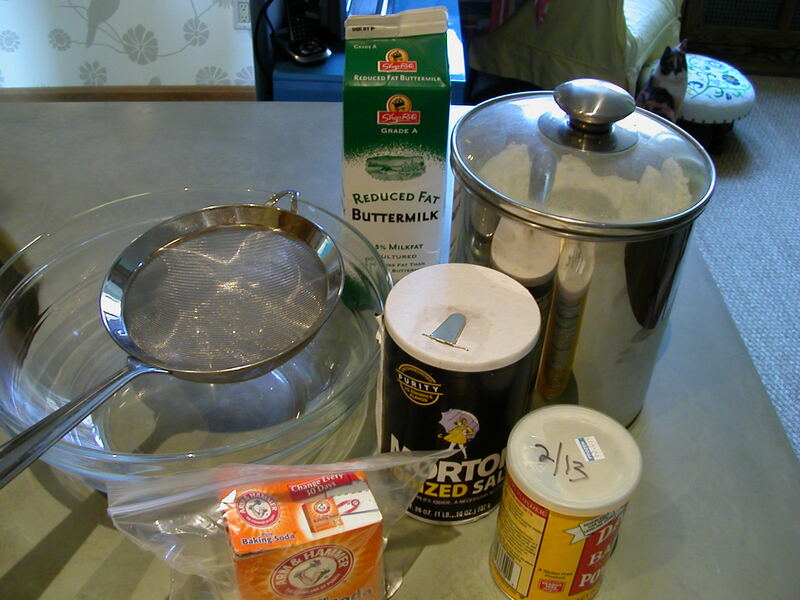 PREP BUTTER MILK: pre-measure it and leave it in the frig until right before you need it. 4. MIX BUTTER AND FLOUR BY HAND: I use my hands which allows there to be both pea shaped pieces but also flat flakes. 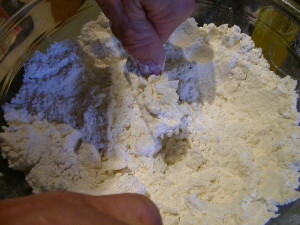 I do a quick pinching/rubbing motion, rubbing the flour into the cubes of butter as they get smaller always keeping my fingers covered in flour. The butter out of the freezer is really hard so the heat of your hands doesn’t affect things if you work fast. I think use a fork to mix when I add the buttermilk. 5. 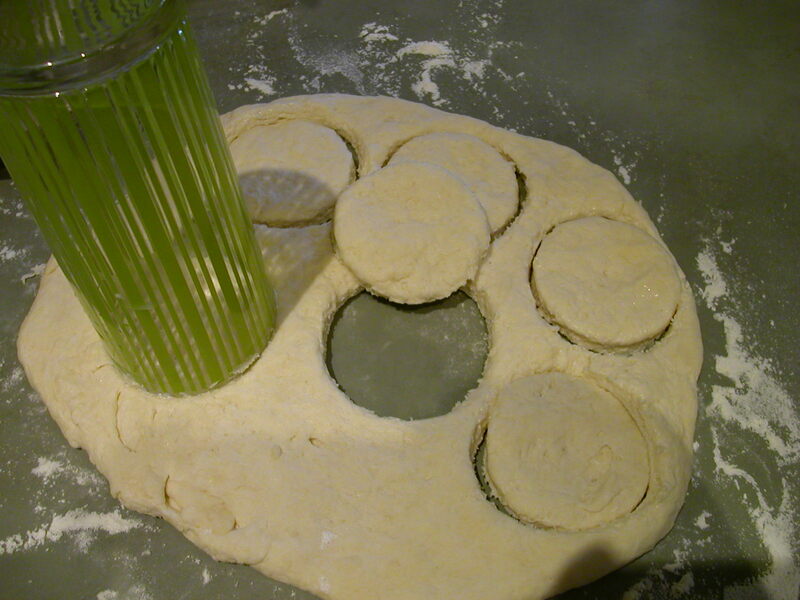 CUT BISCUITS CLOSE TOGETHER: when you press the biscuit cutter (or glass) do each cut as close to the previous one as possible so you have fewer smaller scraps to put back tougher for the final few biscuits. 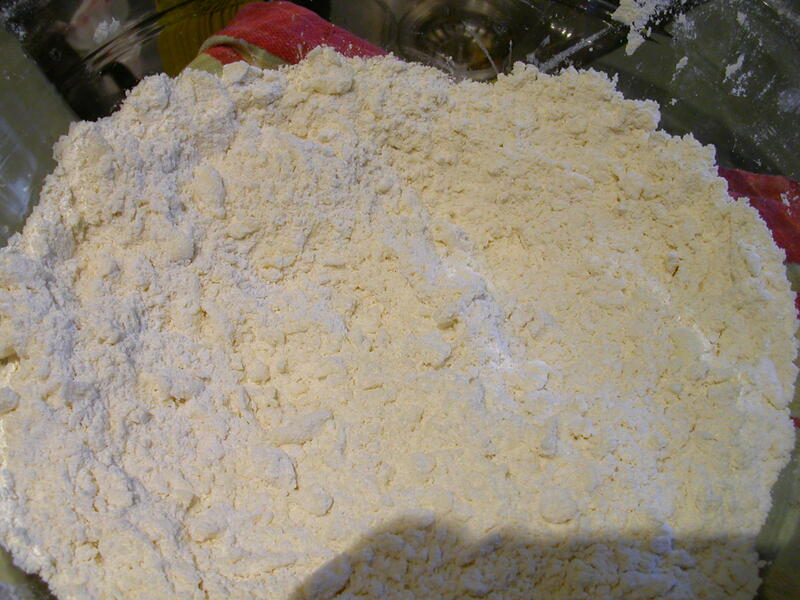 Also, I dip the cutter in flour, not water. And do not under any circumstances twist the cutter; press down and pull up. Twisting works the batter. 6. USE A GOOD PAN AND PARCHMENT PAPER. The pan is everything (I like Vollrath) and parchment allows the tops to get light brown but the bottoms not to overcook. 7. 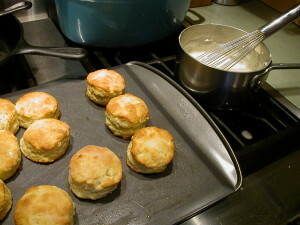 IF YOU FEEL THE BATTER GOT TO WARM, put the cut biscuits in the freezer for 20 minutes and then directly into the oven. That’s all I got for ya! Not sure you need this because yours looks great! 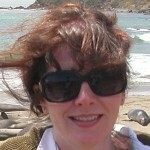 Ladies and Gentlemen – The expert appears! Thanks SO much, Michael! Really great tips here. I’ll definitely employ them this weekend and report back. Excited!